Have you heard of a lionfish? Zebrafish? Maybe a turkeyfish? How about a firefish? No? Well, you will, because it’s all the same fish, and they are taking over the oceans and becoming a huge problem to the reefs and ecosystems of the Atlantic Ocean, the Caribbean Sea and the Gulf of Mexico. You see, Lionfish are not naturally from these waters. However, within the past 10 years or so, they have made them their home. Recently, I was fortunate enough to travel south of Florida and past Cuba to the beautiful British Overseas Territory of Grand Cayman Island. Here I met, dove and dined with master divers, top chefs and environmental experts in an attempt to learn more about this venomous fish that is making our oceans their new home. As a result of this trip, I can now highly and personally recommend the Cayman Islands as one of the best places in the world to see, hunt, capture and eat lionfish. You should also know that when you do this, you are helping control the global lionfish population and helping the oceans and the environment. It’s easy to find lionfish on the menu in the Cayman Islands. They serve it at most seafood restaurants, from the Lobster Pot in George Town to Michael’s Genuine Food and Drink in Camana Bay. I was there for four days, went on four dives, culled about ten fish and ate lionfish every day. I ate it raw in ceviche, pan roasted, grilled, pan-fried. I did my part to control the population. I also learned a lot about this invasive fish and how it got to be such a big problem. The lionfish is a beautiful, exotic, adaptive, voracious, prolific and venomous fish indigenous to the Indo-Pacific. Its venom is an exterior coating on its dorsal fins that can cause serious harm and illness to humans and its sea dwelling co-habitants. The lionfish is kept in check in its native waters of the Indo-Pacific because sea creatures are used to its aggressive stature and behavior, and recognize its eggs as a food source. Here in the Western Hemisphere, this fish is a mystery to the indigenous species. Exactly how these fish came to these waters is not completely clear, and is hard to prove. However, it is a popularly kept fish by saltwater aquarium enthusiasts; it is likely that someone had a few of these in a tank in their home and the fish grew too big to handle or flush down the toilet. Judging from the currents of the Gulf of Mexico and the Atlantic Ocean, and where they first popped up in the Bahamas, experts guess that after decimating a home aquarium, the owner(s) set them free somewhere off the coast of Florida. Since humans most likely caused this invasion, it only makes sense that humans do something to solve it. Good thing they are tasty! My diving and dining companions all belong to a group called C.U.L.L. (Cayman United Lionfish League), and held their first lionfishing tournament in 2010. This was a way to educate the community and get them involved. 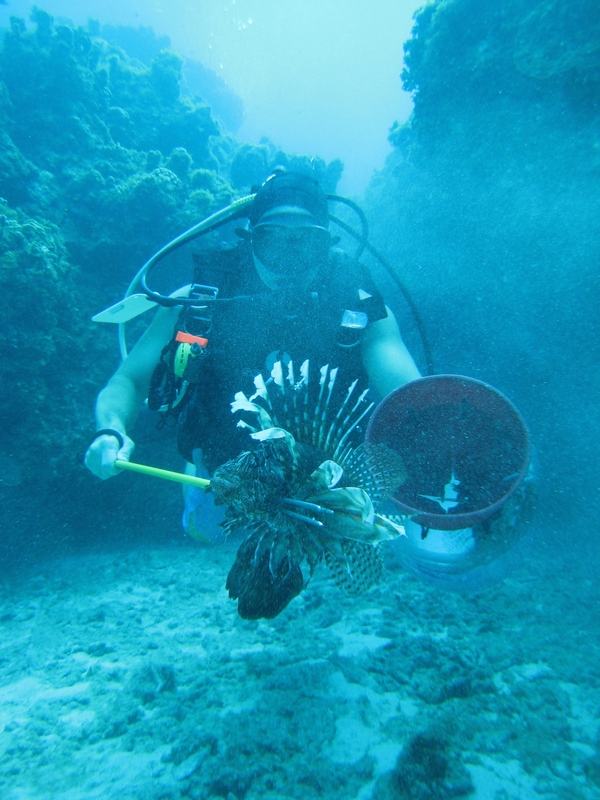 During the two day event more than 500 lionfish were caught. The highest pull for a tournament was in December of 2012 with almost 1,400 fish. Washington said, “You can tell the difference when you dive the reefs. You used to drop in the water and see 15 to 20 immediately. Now, when you dive the heavily culled and maintained areas you’re lucky to pull four or five on a dive”. Chef Thomas prepared a delicious meal with the lionfish we had speared earlier that day. We started with a lionfish ceviche with citrus avocado coconut jelly and red pepper, scallion and cilantro. This is the best ceviche I have ever eaten in my life. I compared the taste and texture of the lionfish to sashimi flounder. The cooked version came as pan roasted lionfish with ackee seasoning pepper. This was equally delicious, and prepared like this the lionfish was flaky and similar to snapper. Throughout my trip I continued to eat lionfish and talk to people around the island, at the resorts and in the bars and nightclubs. Some people had never heard of lionfish and others (even locals) had never tried it. I made sure to tell everyone how much fun they were to catch and how delicious they were to eat. The Cayman Islands are always ranked among the top five places in the world to dive. Their beaches are beautiful, their resorts are top notch and their restaurants are full of a delicious new delicacy… LIONFISH. So, whether it’s a family vacation, a diving adventure or one of their many special events or street festivals, put the Cayman Islands on your calendar and some lionfish on your plate.